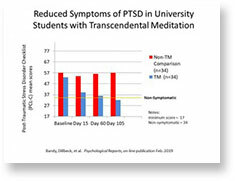 A new study conducted at MUM’s partner school, Maharishi Institute in South Africa, found that the Transcendental Meditation® technique reduced students’ symptoms of post-traumatic stress disorder (PTSD). 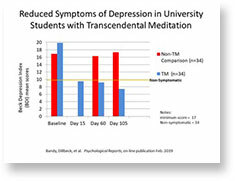 Published in Psychological Reports, the study found that after 3.5 months of practicing the Transcendental Meditation technique, most of the 34 Maharishi Institute students who participated in the study – all of whom were initially diagnosed with PTSD by mental health professionals – went below clinical thresholds. The students also experienced relief from depression. An international research team of seven scientists and psychologists conducted the study. At the start, the students had a score of 44 or more on the PCL-C test (a standardized self-report rating scale for PTSD). A score above 44 indicates likely PTSD and below 34 indicates that one is below the PTSD threshold. Symptoms included nightmares, flashbacks to traumatic events, anxiety, fear, and hypervigilance. They also reported emotional numbness, anger, and violent behavior. At the conclusion of the study, the average group score of the MI students was below the PTSD threshold. A comparison group of 34 students from the University of Johannesburg suffering from PTSD and depression received no treatment and continued to show no change in their symptoms throughout the study. This is the first study of its kind to show how the Transcendental Meditation technique can reduce PTSD in college students. Learn more about other PTSD research and projects here.